For years, nearly all of the world’s iPhones and iPads rolled off the assembly lines of a single company: Foxconn. It was a famous partnership between two outsize personalities— Steve Jobs, Apple’s intense and mercurial co-founder, and Terry Gou, the Taiwanese manufacturer’s equally demanding chairman. But under current CEO Tim Cook, reports The Wall Street Journal(May 30, 2013), Apple is dividing its weight more equally with a relatively unknown supplier, giving the technology giant a greater supply-chain balance. Pegatron will be the primary assembler of a low-cost iPhone expected to be offered later this year. 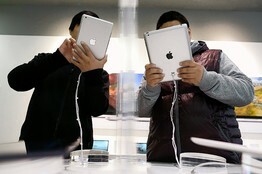 Foxconn’s smaller rival across town became a minor producer of iPhones in 2011 and began making iPad Mini tablet computers last year. Pegatron’s rise means an end to the monopoly that Foxconn, the world’s largest electronics contract manufacturer—has held over the production of Apple’s mobile products. There are strategic reasons for the shift: risk diversification after Foxconn’s manufacturing glitches last year with the iPhone 5 that resulted in scratches on the metal casings, and Apple’s decision to expand its product lines amid growing competition from Samsung and others. Pegatron also has been willing to accept thinner profits as it courts Apple’s business. Ironically, Foxconn’s cost advantages from scale have waned as it works to improve factory conditions after a spate of high-profile worker suicides and accidents in recent years. Foxconn, in its growing heft as the world’s largest electronics contract company, was also getting more difficult for Apple to control, with incidents such as changing component sourcing without notifying Apple. Pegatron, which has about 100,000 employees in Taiwan and China, expects to increase its China workforce in the second half of the year by around 40%. The staffing increase is largely due to expected production of low-cost iPhones.